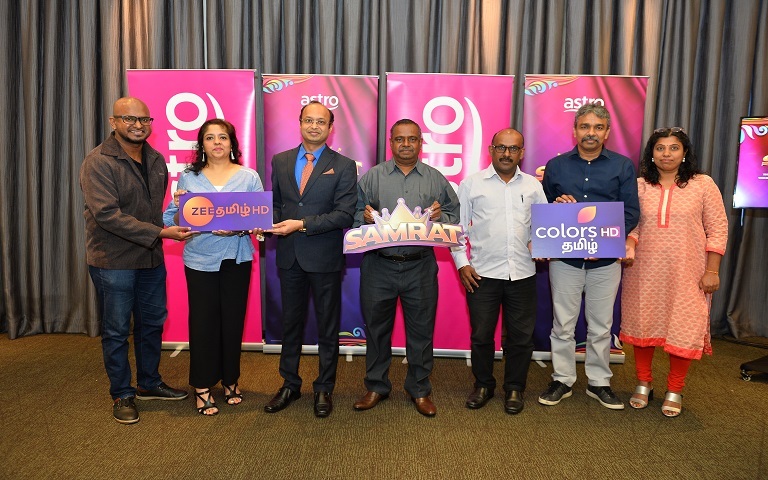 Kuala Lumpur, 19th September 2018 – Astro customers will be able to enjoy more Tamil HD content with the launch of two new channels featuring Tamil movies, dramas, reality shows and series from Zee Tamil HD (CH 232) and Colors Tamil HD (CH233) on TV, Astro GO and On Demand, which will be available for preview at no additional cost from September 19, 2018 until October 18, 2018. Key content on Zee Tamil HD (CH 232) includes Sa Re Ga Ma Pa Lil Champs Season 2, a singing reality show featuring talented children with a renowned panel of judges including vocalist Sujatha, popular playback singer Karthik, evergreen maestro Srinivas and the music composer Vijay Prakash; Comedy Khilladis, a stand-up comedy reality show; Azhagiya Tamil Magal, a drama series starring Sathya Sai, Puvi, Subalakshmi and Anju Aravind; Thenali Raman, a historical comedy-drama based on the life of the legendary Telugu poet Tenali Ramakrishna; Mr & Mrs Khilladies Season 2, an adventure reality show featuring 10 real-life television couples; and, Genes Season 3, a game show, hosted by actress Priya Raman. Colors Tamil HD (CH 233) will capture the distinctive colours of Tamil Nadu with its variety of fiction, non-fiction, and reality shows. Namma Ooru Coloru, a game show featuring real-life couples as contestants performing fun tasks; Colors Super Kids, a unique reality show for talented kids hosted by popular actor Mirchi Shiva; and, Tamil and Hindi-dubbed drama series including Vandhaal Sridevi, Perazhagi, Sivagami, Sangadam Theerkum Saneeswaran, Naagini 3, Marubadiyum and Thirumanam. • RM10 per month for Astro Family Pack, Value Pack, and Starter Pack. For more information on Samrat Pack, Zee Tamil HD (CH 232) and Colors Tamil HD (CH 233), log on to www.astroulagam.com.my/samrat!